You can make a strong investment in your home's exterior for years to come with siding products from Norandex-Reynolds. With a wide range of Reynolds vinyl siding products available in a rainbow of colors, you have a vast variety of options for your home. Polar Wall Plus! 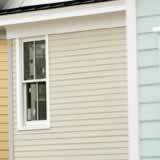 : Come in from the cold or beat the heat with this insulated, energy-efficient vinyl siding. The thick .044-inch panel pairs with a strong nailing hem to help keep the elements out. Grand Junction: Replicate the look of cedar with this premium vinyl siding. This siding is built to last, resisting hurricane-force winds while maintaining an authentic, beautiful look. Town Square: Go with the rich, embossed finish of wood grain with the convenience and durability of vinyl, available in 16 classic colors. Summit Manor: Choose a classic style with a competitive price with this low-maintenance style in a variety of colors. Rustic Blend Plus Board and Batten: Combining the classic appearance of weathered wood with the strength of solid vinyl, this rustic blend pattern makes a statement in four available colors. Board and Batten: This unique vertical application makes a strong statement in your choice of six designer colors. Reynolds vinyl siding is available from Norandex, which distributes to retrofit, remodeling, roofing and home exterior companies. Hire a professional to install your Reynolds siding and enjoy the benefits of quality construction for years to come.